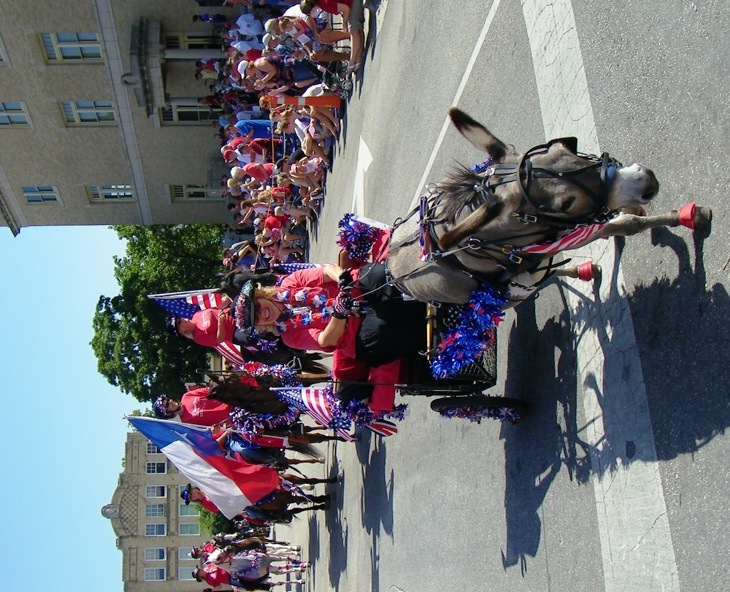 McKinney puts on the red, white and blue for the annual July 4th hometown parade. July started with a BANG in McKinney… or rather with a “BOOM” as in Red White and BOOM! Thousands turned out on the downtown square for the July 4th hometown parade, the street fair and the car show, all taking place under the bright, hot sun and insanely gorgeous blue sky. Even more thousands filled the soccer complex at Craig Ranch that night for a concert by McKinney’s own Jon Christopher Davis and his band Lone Star Attitude followed by the city’s annual fireworks display. Now as we enter the first full weekend of the month, get ready for some great music by local talent, some great art created by local artists, and even a couple stage productions of popular musicals. Then of course, there is always nature to enjoy in McKinney! McKinney Summer Musicals‘ production of “My Fair Lady” kicks of this weekend on Saturday night (July 7) and Sunday afternoon (July 8) – and finishes with four shows next weekend. (Click the show title above for tickets.) The show is at Boyd High School. 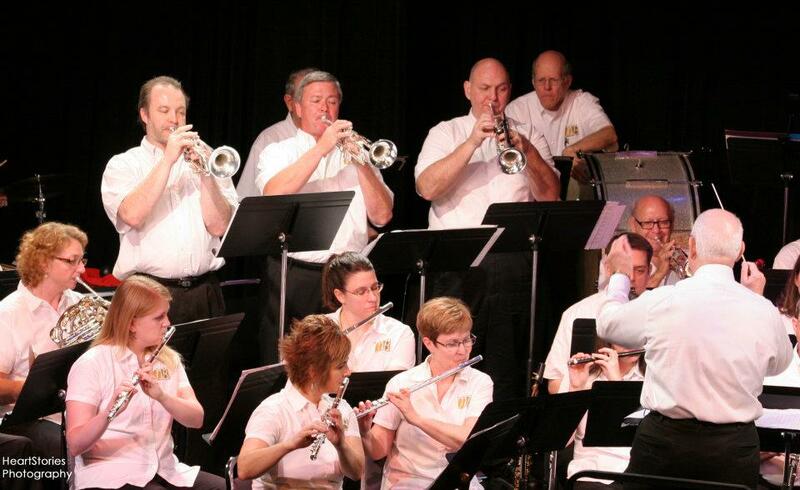 The McKinney Community Band performs a free concert at MPAC on July 14. During Second Saturday, yes, some of the shops downtown are open late, but regular visitors to this monthly event know it’s really all about the arts – new art gallery exhibit openings with meet-the-artist receptions in the downtown art galleries, and live music rocking-out so many of the restaurants/wineries downtown. Click HERE for a list of participating businesses on the square. In addition to Second Saturday, Orisons Art & Framing will host one of its popular “Art in the Making” events on July 21, featuring the art of local artists Annie Royer, KD Hafley, and David Hobson who will be on hand creating their art as guests to downtown McKinney can watch and ask the artists about their work. Another performance downtown this month is by the talented youth of McKinney! The McKinney Repertory Theatre’s Broadway Bound campers bring their acting and singing gifts to the MPAC stage for four shows of “Disney’s Aladdin Jr.” on July 19-21. At the Heard-Craig Carriage House on Friday, July 20, enjoy a free concert “Bluegrass to Jazz” presented by the McKinney Arts & Music Guild. The concert is from 6:30-7:30 p.m.
A boy meets a butterfly at the Heard Museum butterfly house. It may be hot out, but that doesn’t stop the butterflies, birds and other nature from being available to commune with people! 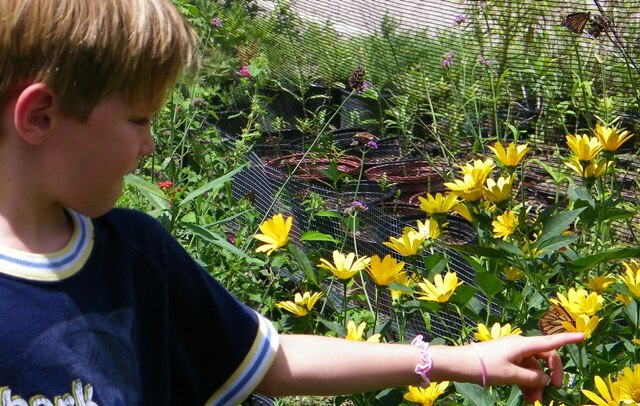 The Heard Natural Science Museum and Wildlife Sanctuary opened its Butterfly Gardens and House last month, an attraction that will be open until September 30. And this month, the Heard offers a Free Resident Day on July 15 (McKinney residents, bring your water bill with you for free admission) and throughout summer, the Heard offers its summer camp programs for kids. Also, don’t forget the Animal Superheroes exhibit running throughout the summer. 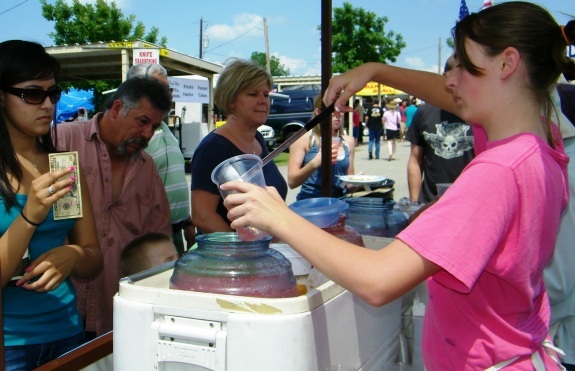 Fresh juice quenches hungry shoppers at Third Monday Trade Days. Old Red Lumberyard Vintage Sale, July 13-14, 600 E. Louisiana. Third Monday Trade Days, July 13-15, 4550 W. University Drive. TreasureSpotters, July 14, 401 E. Virginia. NEW! Just opened on the square this week (July 4) is Snug on the Square, a place for shopping and eating. Check out their Facebook page HERE! Visit McKinney Texas: Our App and Social Media! Remember “everything McKinney” is always at your fingertips with our Smartphone app. Links for downloading it to iPhone, iPad and Android can be found HERE. And if you need to check out McKinney on your computer, you can find us at our website or on Facebook and Twitter. We’re even working on growing a Pinterest page! ← Here Comes Summer: Why Not Learn Something New!